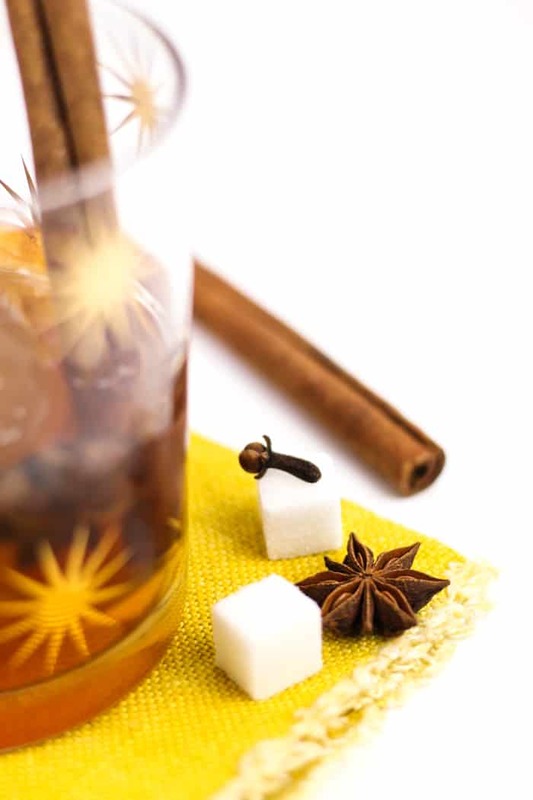 A Chai-Old Fashioned Cocktail is the fall and winter nightcap of your dreams. 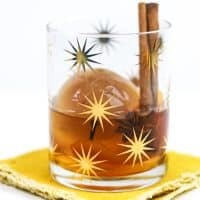 Made with cardamom bitters and chai tea ice cubes, the chai spices infuse slowly as the ice melts into the whiskey, letting more flavor seep in with every sip. Chai is without a doubt one of my favorite flavors. 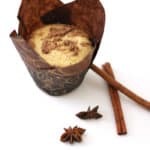 You’ve seen it a lot around here, from Chai Spice Streusel Muffins to Molasses Chai Cookies to Dirty Chai Cinnamon Rolls. But I regret that chai hasn’t made it into any cocktails around here yet, so I am setting out today to change that. 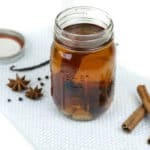 A few months ago, I told Chris — who makes at least one old-fashioned cocktail a week — that I had an idea for a chai version, and his face lit up with that big, goofy grin I fell in love with. We set to work that very night making chai tea and freezing it into ice molds for the next night. The result was a whiskey cocktail we have made over and over again all fall long, and I had to share it with you, especially with Thanksgiving coming up in a few days. 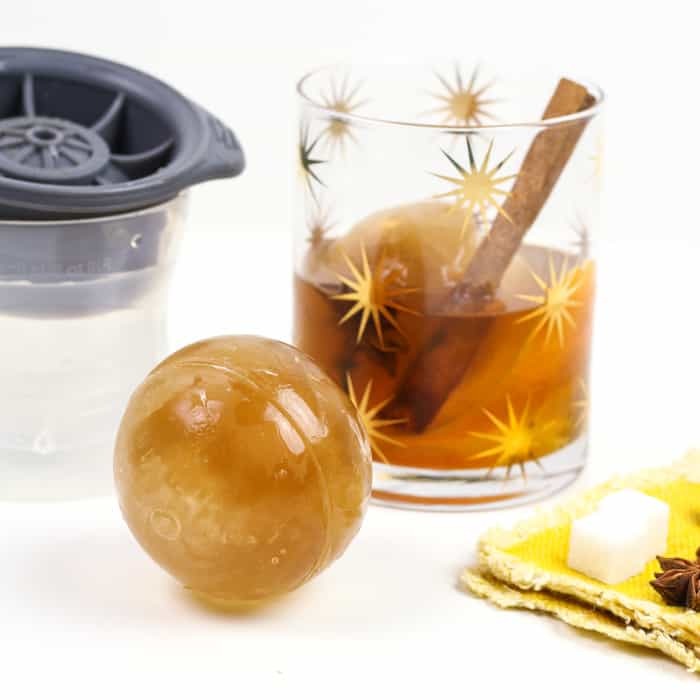 First you’ll make chai tea, let it cool and then pour it into ice molds. 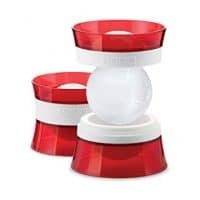 Big ice sphere molds or large ice cube trays would both be fine. Then freeze! When the ice cubes are frozen through, add them to cocktail glasses and make the cocktail. 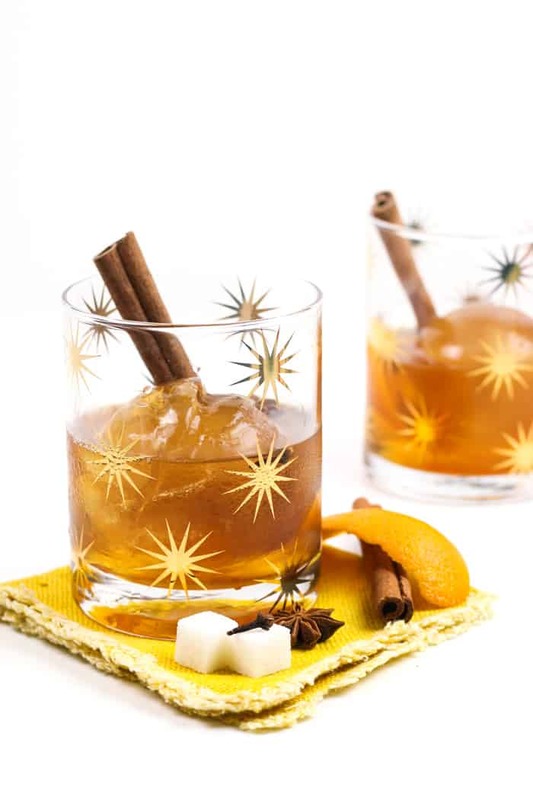 You’ll need bourbon, an orange peel, cardamom bitters and some kind of spice for a garnish. 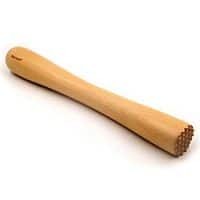 I used star anise, a clove and a cinnamon stick. It’s perfection. 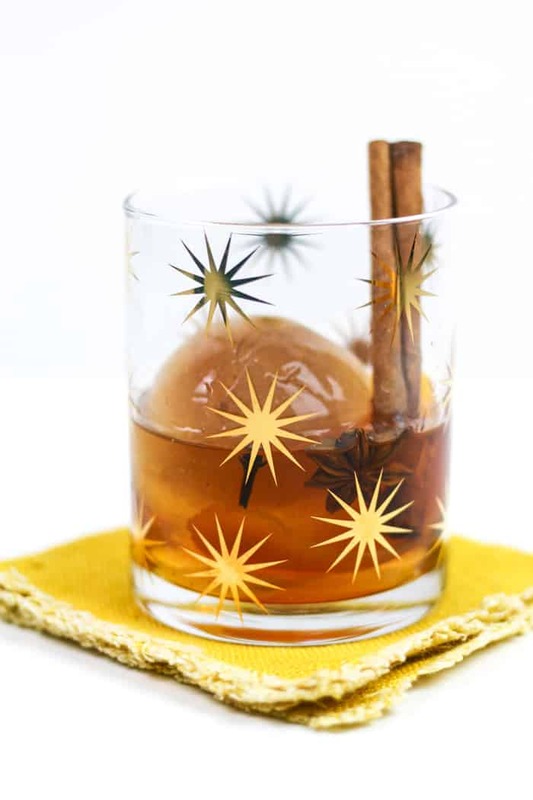 This Chai Old-Fashioned is a cocktail we love, and I hope you enjoy it as much as we do! Tea and cocktails go so well together, so you can really have fun and make ice for old-fashioneds with just about any kind of tea you can think of. I once had the best chai latte of my life at a shop in D.C. (where I write this from now — and will be headed there later today for my fix). Teaism uses a mixture of spices in their tea, and that’s the kind I like for my own chai. I typically use a loose-leaf chai tea, but tea bags are absolutely fine. 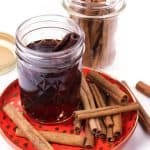 Look for flavors of black tea, black pepper, cinnamon, cardamom and cloves. What kind of bitters should you use? 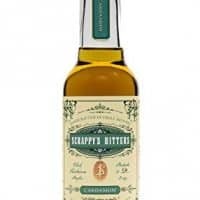 The cardamom bitters really make it in my opinion, but if you don’t have that on hand, you can make do with other kinds of bitters. Orange bitters or even Angostura bitters would also be lovely in this drink! 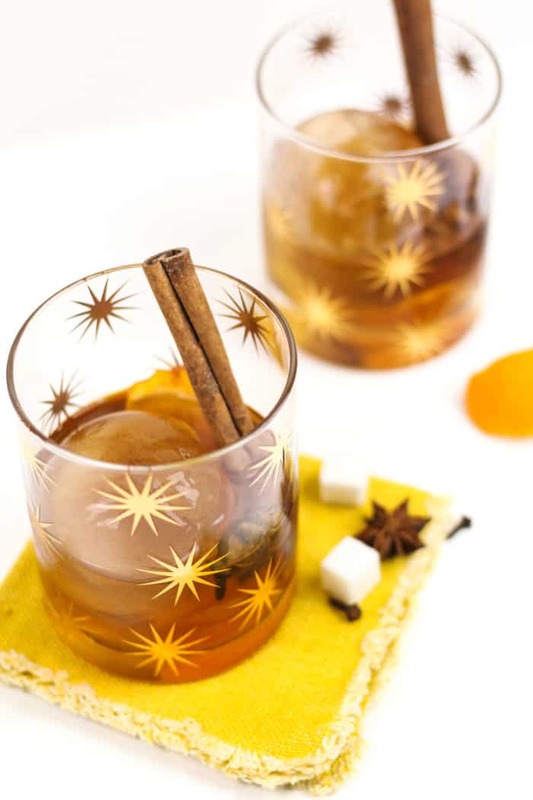 The Chai Old-Fashioned Cocktail with Chai Ice Cubes is a lovely fall nightcap. 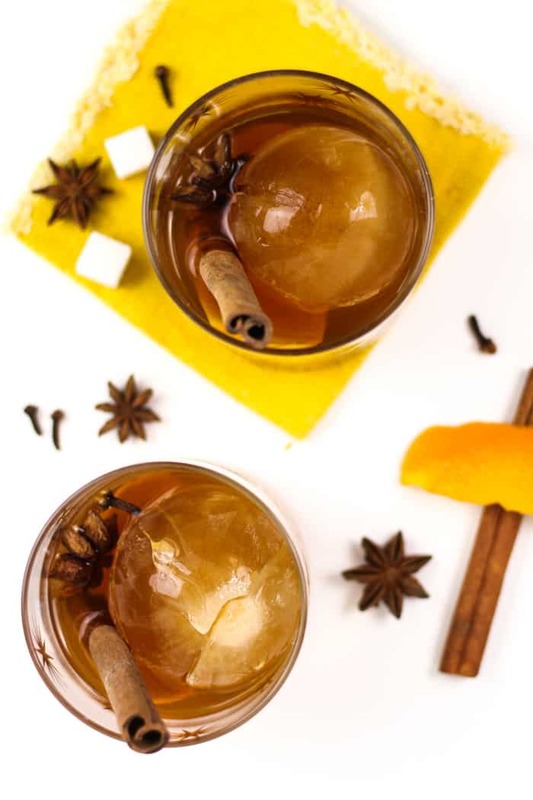 With flavors of cardamom, orange, tea and spices, each sip is more flavorful than the last thanks to the tea-infused ice cubes. Remove tea bags after 5-8 minutes. (Longer yields a stronger flavor). Let cool. Once cooled, pour tea into ice cube trays. Place molds in freezer until ice is frozen through, about 6 hours. In two rocks glasses, add a sugar cube to each. Add a dash of cardamom bitters to the sugar cubes, then add the orange peels. Muddle the sugar with the bitters and orange peel to release the flavors of the bitters and the oils. Top with whiskey and stir until sugar dissolves. 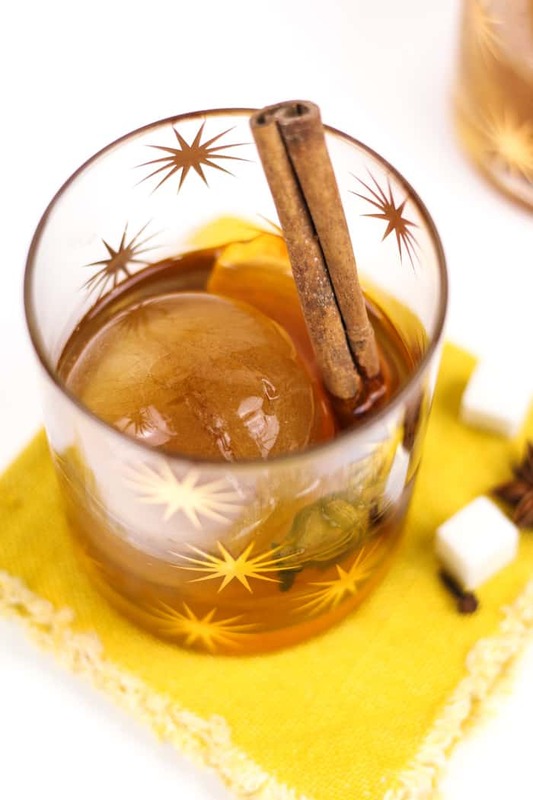 Add the chai ice cubes, then garnish with whole spices such as cinnamon sticks, cloves and star anise. 2 teaspoons maple syrup or simple syrup can be used in lieu of sugar cubes, to taste. Angostura bitters or orange bitters will also work if you don't have cardamom bitters on hand.